Lynnelle Jessup and Mick Russell are the happy new owners of Tin Can Bay’s Café to the Max. Originally from Armidale, NSW, they were up for the Australia Day weekend and Coondoo Creek meant their 3 day stay was extended to a week. The next day Lynelle rented a place. About three days later they made an offer on the café. Mick was working for Cleanheat and Lynelle was helping out in a bakery and they are thrilled with the move to the coast. Plus they are closer to family. Lynelle is the daughter of well-known local, Arthur Jessop who has owned Tin Can Bay Bakery for the last ten years. She worked with her Dad in bakeries when she was younger. 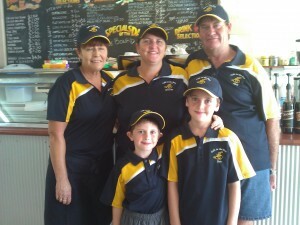 Her brother is Darren Jessup of Cooloola Cove Bakery. So you know the cakes at Café to the Max will be good! Trade has been busy, and they are grateful for all the support from locals. Their new lunch specials (chicken tenderloin or beer battered flathead wraps) have been the most popular items. Also new to the menu are their quiche and salad, cake special and coffee and cake deals. Breakfast muffins and wraps are also available. Lynelle says they have bought a new coffee machine, “It’s the same coffee, but it tastes even better now”. She also has a sideline that has been a real hit with visitors. “I make icy holders – like stubby holders for kid’s iceblocks.” See her displays instore. Café to the Max is open Monday to Friday 7am-3pm, dine in or takeaway. Drop in and try out some of their new deals at the Dolphin Shopping Centre on Tin Can Bay Road. What do we think about illegal camping?